Joshen Will Assist You In Delivering Your Message! Click here to contact us to receive more information on Supply Products, Joshen's flexible Distribution Programs, or Procurement Solutions. What's the most cost-effective option for delivering your supply products to your locations? Joshen will customize a Distribution Program for you. Click here to learn about Joshen's flexible Distribution Programs. Every business operator knows the advantage of custom printed supply products, and every manufacturer or warehouse is in need of some form of custom printed material. The obstacle is the minimum order quantities that many manufacturers require in order to print your supply products or materials. Need to decrease your inventory investment for your custom printed supply products? If your a retail chain and your custom prints are stored at your office or distribution center, do you want to not have to manage these items any longer; stop the time spent for your own employees picking and pulling these to ship to your stores; become more efficient and free-up your time? That's one of the many advantages of Joshen being your supply solution provider. We'll procure your custom prints, warehouse them, and deliver them to your stores when you need them; freeing your time & cash flow for purchasing your profit generating retail items or raw materials for manufacturing. The more your customers see your graphics and merchandising message, the more they remember your products. Joshen's user friendly packaging and disposables can promote your products through graphics; enhancing your identity while helping to build repeat sales! Have our award winning graphics department design a customized program for you, with our custom print packaging and disposable program expertise. Let Joshen assist you in delivering the merchandising message that will keep your customers coming back! Joshen is The Total Package for your Custom Print Packaging Solutions! Whether you are a supermarket or c-store in need of custom print merchandising or scale labels, a retailer looking for custom printed price marking labels & shelf talkers, or a manufacturer or warehouse in need of identity or barcode labels, Joshen has the ability to work with you from procurement to delivery of your label and sign card supply needs. Joshen is The Total Package for your Custom Print Labels & Sign Card Solutions! Contact us today so that we can discuss your custom print needs. 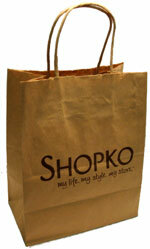 Continue your merchandising theme through all your paper and plastic bags! 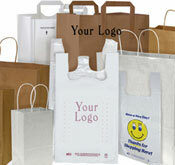 Whether your business needs paper or plastic shopping bags, pharmacy bags, optical bags, garment bags, newspaper bags, manufacturing parts bags, private-label lawn & leaf bags or lunch bags, Joshen has the procurement solutions and economies of scale to provide you with all your custom print bagging supply needs. Plus with our warehousing and transportation solutions, Joshen will maintain the inventory for you, and deliver your product to you when you need it; on-time everytime! Joshen is The Total Package for your Custom Print Bag Solutions! Have a company special event or new program roll-out in the near future? Do you need to communicate your marketing message quickly and with low minimums for these types of events? Joshen has all the manufacturing sources of supply for these types of events, and our staff can assist you from design to print to delivering the custom print products to your business with our distribution programs. Joshen is The Total Package for your Custom Print Special Event Solutions!